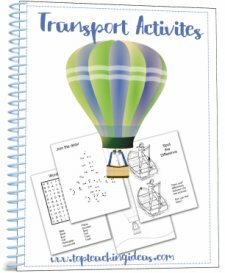 Choosing a Fairy Tale Theme to do with your class opens up a 'Pandora's' box of activities covering all areas of the curriculum. The topic can last just as long you need it to last. For one day or for a whole term if you wish. You can dip in and out of the different stories picking the activities which suit your children.Most of the ideas on this page can be adapted to accommodate a variety of age ranges and can be chosen to challenge their problem solving abilities as well as develop their imaginative skills. So, go ahead and plan your fairy tale theme. But don't forget that you can pick and choose the bits that you think your children would enjoy doing most. With a nose as long as a hooter! And I'm going to eat you up. 1. A great way to start a new theme or topic is to read a story. So have fun reading the story of the 3 Billy Goats Gruff to your children, putting on different voices for the different characters in the story and chanting the trolls song every time it crops up! Once they know the story well they could act it out. You might prefer to make it a group activity where you split the class into groups of 4 or 5 [they could have a narrator with 5] or if you preferred a more relaxed session 4 children could act it out in front of the class. 2. Read several different versions of the same story and discuss with the kids the differences that they noticed. Perhaps the troll looked or acted differently or the settings were different? All good for language development! 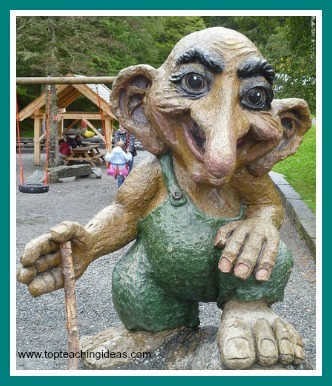 Ask the children to write down or think of some questions to ask the troll.One of the children could then pretend to be the troll and the rest of the class could ask him/her their questions. You could record their answers and write a Troll Profile to add to the bulletin board at a later date. 5. Make stick puppets or masks for the characters in the story to use in their roll play. 6. If you are lucky enough to have a bridge construction outside, the children could use their puppets or masks to act out the story. 7. Put out junk materials for the children to make a bridge. Tell them it must be strong enough to hold a toy goat. We used our small world animals for testing. This is an excellent activity to encourage problem solving and team work. If you are lucky enough to have large bricks and planks as equipment in your school then the same activity could be tried outside.The children could pretend to be the Billy Goats to test the strength of the bridge as they act out the story. I did this with my class and they even made sure there were 3 different sized children to match the small, medium and large Billy Goats!! I did keep a watchful eye on this activity however. Their bridge building skills were not too clever to begin with! Be sure to take some pics of the results! 8. In circle time we discussed how else the Billy Goats could get from one side of the river to the other. I was surprised at how many different suggestions they came up with. One great idea was to build a raft so we decided to try this out. I gave them a pile of lolly sticks, some corks, a kitchen sponge, paper and glue and left them to it. When they had finished we tested them out in the water tray putting a playmobile animal as a passenger. A good floating and sinking science experiment! 9. Pretend that the Gruffs sent a letter to the class asking them to make some cookies for the troll. [ His favourites are choc chip cookies] Ask the children why they think the Goats would want you to do this? Perhaps it's to distract him so that they could all cross the bridge at the same time without him noticing? What do they think? Make the cookies with the children. Give some to the troll and eat the rest in snack time! 10. Make Terrifying Trolls out of clay or play-dough. Use buttons and straws and anything else you have to hand to make them look really fierce! 11. Get out the musical instruments and challenge the children to make quiet sounds for the small Billy Goat, louder sounds for middle Billy Goat and really loud sounds for the Big Billy Goat. II think this was my favourite story in the fairy tale theme. There was so many activities that were open ended which lent themselves to challenging the children's problem solving skills. Remember: Education is not a matter of filling the pail but of lighting the fire! I'll grind his bones to make my bread! Circle Time Questions to spark Imagination! But first read, or even better, tell the story of Jack and the Beanstalk to the children letting them join in with the Fe Fi Fo Fum bit each time! What do the children think about Jack selling the cow for a handful of beans? Would they have done the same thing. What would their mum had said? If they saw a beanstalk outside their bedroom window, would they climb it? Suggest to the kids that they did climb the beanstalk and when they got to the top they crept inside the giants castle . What did they see/ hear/ feel? Then the Giant suddenly shouts 'Fi Fi Fo Fum ! They are really scared. Would they take the hen, the harp and the gold? If not why not? 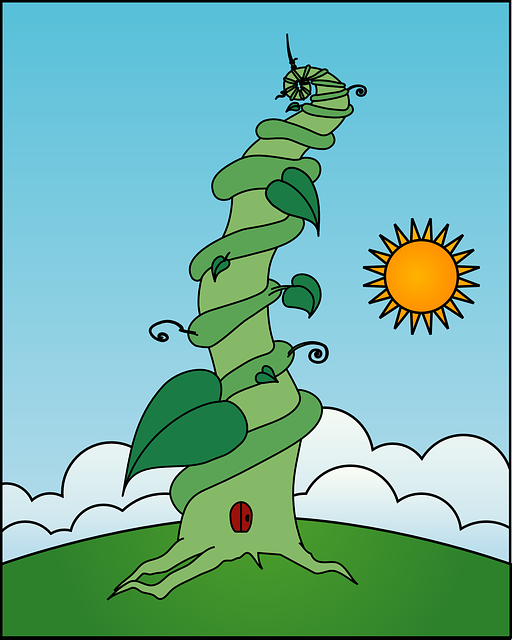 Why did you try and kill me by chopping down my beanstalk? Why did you steal my hen and my harp? I only ever wanted a friend to play with! How would this make them feel? Would they want to go and find him and say they were sorry? Following the discussion, older children could write a reply to the giant. 1. Read Jim and the Beanstalk by Raymond Briggs to your children. It has a different take on the original story and a lot more scope for interesting and challenging activities for your fairy tale theme. 2. Talk with the children about non standard measures and discuss the drawbacks of using this method to measure important distances. Then get them to either fill in a data collection sheet that you have prepared or even better, one they have made themselves. Do the same with foot length. Record it on the sheet. Draw round their foot on 1cm squared paper, cut it out and work out the area. Record this too. Measure both heights and record these results as well. They could also include the giants measurements on their data sheet. Discuss what implications it would have had on the size of the giants glasses or teeth if Jim had told the optician the giant needed glasses that were 10 of Jim's s spans wide. Would the optician have made them too small or too big? The children could finish this activity by making a pair of glasses for their partner out of pipe cleaners! I think they should measure using standard measurements this time! Divide the kids into small groups and get them to sort the beans by any criteria they choose. They might like to find out the names of each type of bean and discover how to grow them. Once they have sorted them they could make a graph of their findings. This is a must for your Jack and the Beanstalk fairy tale theme! You can make this activity as scientific as you like. The older the kids, the more in depth experiments you can carry out. For very young children all you need to do is to allow them to grow their own bean! They will love it! They will learn that their bean needs light and water to grow. They can measure it with non standard measures and enjoy a bean salad at snack time! Job done! Whereas for older children, you could carry out more controlled experiments. Put 1 bean in the perfect growing position ie with light, warmth and water and another in a negative environment. For example, a dark cupboard or cold shed depriving it of light and water. Get the kids to make a diary of what happens to each one over a period of a few weeks. My kids loved doing this! We started by painting big leaves and twirling some crepe paper into a long thin rope-like shape. Then I got a group of kids painting a BIG giant's castle to place on the top of the beanstalk. The last job was to draw round one of the children, paint it and cut it out. This is Jack and he is going to be climbing up the beanstalk when we have assembled it all. Lots of learning talk comes out of this team building activity that you cannot contrive. I do a lot of my assessment through just listening to the kids conversations! 6 Use a Robot to explore the castle. There are lots of different kinds of floor robots available these days and this is a great way to incorporate ICT into your Fairy tale theme. Start by joining several large sheets of paper together and get the kids to create a large scale floor map of one of the levels of the giant's castle. Include 3D doorways for the robot to get through. Then create several different tasks for the robot to carry out. You could for example, hide some treasure in one of the rooms of the castle. Get the robot to navigate his way in and out of the different rooms to reach the treasure. The kids could label each room and dress the robot up as Jack and take him for a walk around the castle. 7 Make a play area for your fairy tale theme by building a 3D castle out of large bricks. This could be used for other stories too. 8. Design a floor tile for the Great Hall in the Giant's castle. Look at some floor tile designs and get the kids to design their own. Hold a competition to vote for the most original.You could introduce mosaics and allow them to experiment wit torn up pieces of paper. An Ideal way to lead into a Roman Topic. The 3 Little Pigs. A Fairy Tale Favourite! Little Pig,Little Pig, can I come in? I will not let you in. And I'll blow your house down. The activities I have chosen for this fairy tale theme story are geared more towards younger children. The story is a favourite with pre-school and kindergarten kids so read on and be inspired! 1. Read or tell the story of the 3 Horrid Pigs and the Big Friendly Wolf as well as the normal 3 Little Pigs story. Compare the 2 stories. Which story did they like the best? Hot Seat the wolf or a Horrid Little Pig and see what reactions you get! Actually there's a whole weeks work you could do with this book. Watch this space! 2. Hide the Bricks game. Get the kids to stand in a circle and put their hands behind their back. Give one child the basket with the shapes in and ask him/her to go round and put a 2D shape in each child's cupped hands. Children feel their shape and see if they can identify it without looking at it. You, then ask anyone with a triangle to put it back in the basket. Do the same with the other shapes until every child has identified their shape. Talk about the properties of each shape as they are revealed. 3. Who can build the strongest house? Give a group of kids a pile of building blocks and ask them to build a really strong house for the Little Pig. A house that the wolf cannot blow down. Afterwards discuss what shape makes a sturdy house? Tall and thin or wide and flat? 4. Make Bottle Bowling Pigs! This is a great activity that the kids can make for themselves just out of your craft box. Once you have cleaned out the bottles and allowed the to dry, put about 3 inches of sand or rice in the bottom of each bottle. The kids can do this themselves if they use a funnel and providing you're prepared to sweep up afterwards! Put a little of the pva glue on the inside of each lid to make sure it stays put! Let it dry. Mix each colour paint with a little of the pva glue and paint the bottles. Allow to dry and then paint a piggy face on the side. When they are dry you are ready to go! A game of 10 pin piggy bowls! A word of warning about these activities! Be sure to tell your children the difference between blowing and sucking. I have on more than one occasion ended up trying to get paint out of a child's mouth because they sucked rather than blew!! Perhaps a pair of adult eyes are a necessary extra! Use fairly runny paint for this activity and get the children to drip paint onto a piece of white paper. [You can use colored paper but the effect is not so dramatic] Do this several times with different colors. Then allow the children to take their straw and BLOW the runny paint so it travels all over the paper. They can keep adding drips of paint until they are satisfied they have an awesome piece of artwork! Start by mixing the paint with the washing up liquid. A different color in each cup or bowl. Get the kids to blow into the paint with their straw until the bubbles reach the top of the container. When this happens quickly pop the white paper on top, move it 2 or 3 times to make sure it gets covered and bingo you have a huff puff piece of art! Use pieces of straw small sticks and lego bricks to paint with. You can get some fab results doing this! I did this with my kids some years ago and they loved it! We were lucky enough to have those large wooden hollow bricks in our school so I hijacked them all and set them up outside in the playground. I told the kids that the last little pig had asked me for their help. He wanted them to build a very strong house for him. One that the wolf would not be able to blow down. So I sent them off to experiment. The results were stunning but the bricks kept moving about and getting out of line. What to do? We decided to look at the school building for inspiration. That didn't move about. Cement ,was the answer they decided. So we decided to make some pretend cement out of sand. They had a whale of a time slapping sand between the bricks like real builders and learnt that it had to go on evenly or the wall would end up crooked! Wonderful activity for vocabulary, team work initiative and fun! What big eyes you have grandmama! What big teeth you have grandmama! All the better to eat you with grandmama! Start your Red Riding Hood theme by making a play area for the kids to get into the spirit of the story! Grandma's bedroom is a fairly easy one to construct and can involve the kids in working out with you what should go in it. They might suggest Grandma's bed and a night gown with a bonnet. They could want her to have a pair of glasses next to her bed a together with a bedside story. What story do the kids think that grandma might like to read? You might like to add a kitchen stove into the mix so that Red Riding Hood can make her grandma a cup of tea when she arrives. Then you might suggest that they make a list of items that Red Riding Hood should put in her basket. What do the kids think that grandmas like to eat when poorly? Healthy food versus non healthy food. Discuss. Make some of the food that they have suggested out of play doh or clay. Make a wolf mask with the kids allowing them to draw their own wolf faces on their masks deciding whether they are going to have a good wolf or a bad wolf. I did some circle time work with this idea. I asked the children to make different faces for different emotions. Such a lot of vocabulary came out of such a simple activity. 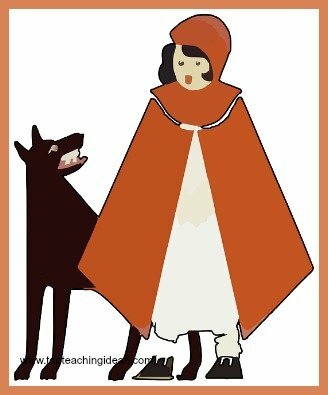 You could discuss what Red Riding Hood's Mum might have said to her before going off to see grandma.Make a list of do's and dont's for RRH to remember when she goes off on her own.For example mum might advise her not to talk to any one on the way or not to pick flowers. You could discuss the reasons for saying these things with your children. They could then make their own list of rules for RRH. 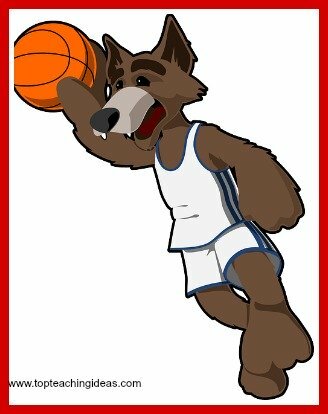 You could 'Hot Seat 'the wolf! Ask him questions to find out if he feels at all sorry for what he did. The children could then write a letter from the wolf to Grandma explaining why he did what he did and apologising or perhaps giving her advice about security!! Think of an alternative ending to the story when perhaps the Grandma is the baddy and the wolf does something heroic! Challenge the kids to draw their own map on squared paper of RRH,s route from her house to Grandma's house. They can include trees, flowers, other buildings and the spot where the wolf was hiding. 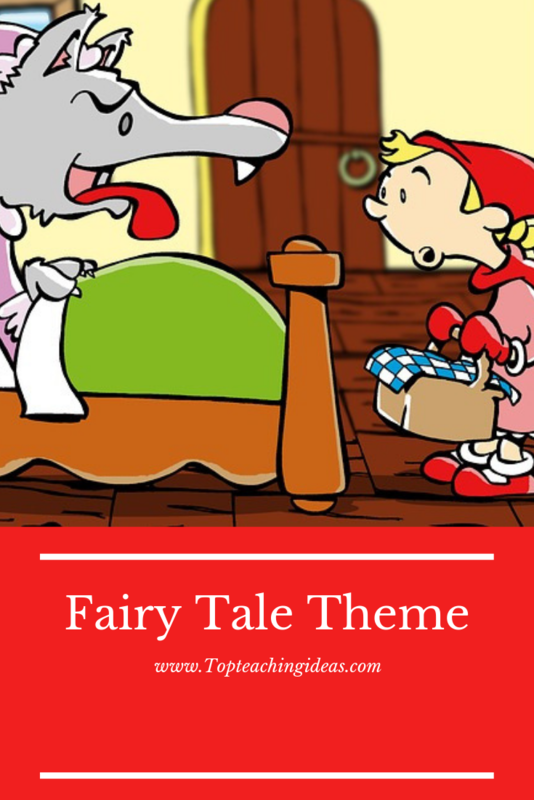 I hope you have found some useful ideas for your fairy tale theme on this page. Perhaps you could follow it up with a Nursery Rhyme theme. 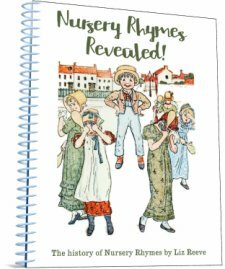 See Nursery Rhyme Activities page. Also you will find some more Healthy Eating ideas on my Food Teaching Theme page. Have a little look!